Hello, my fair friends! Today I'm introducing a new monthly section to highlight Your Fair Style. One reason I started this blog was to show that it's possible to be stylish and kind to the earth. As a continuation of that effort, I'm eager to share examples from around the interwebs of how other bloggers have done that by incorporating fair elements into their wardrobes. I believe we can all dress fairly without too much effort and certainly without spending a lot of money, and hopefully the stylin' ladies above will inspire you to take stock of the fair items in your closet! Our first fair style inspo is Krystin from Be Loud Be You, who's wearing a DIY tulle skirt that she made herself! To understand how awesome this girl is, you should also check out this post, which has EVEN MORE AMAZING DIY TULLE! Cynthia from Simply Cyn aka Addicted2Etsy is wearing one of her many vintage Coach purses, and it gives the perfect pop of red to her breezy nautical look. 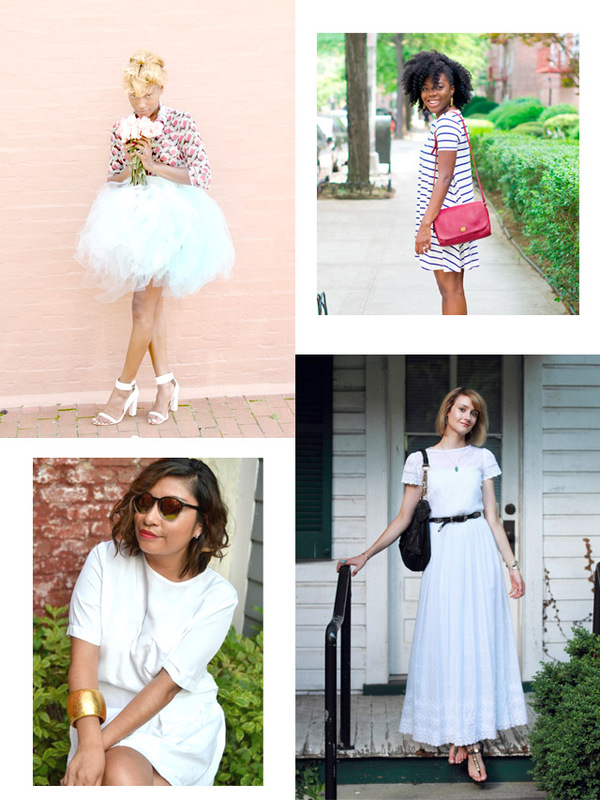 On the bottom left, Carlis from Spicy Candy DC is wearing a thrifted white blouse and thrifted sunglasses. Carlis and Katya have much love and respect for the art of thrifting, and I love to see what they find and how they style it. E from District of Chic is on the bottom right wearing a delicate, white vintage dress that fits her like a dream. I look forward to seeing your fair style!